Fish gotta swim, birds gotta fly and the Obama Administration libs have gotta lie. Apparently so anyway, because they do it habitually. For example, when a reporter caught Secretary of State John Kerry aboard his yacht while a coup was taking place in Egypt, they flat out denied it was true. How much sense does it make to deny it AFTER you’re caught? Yet and still, Obama and his administration are so used to getting a pass from the mainstream media that they lied anyway. Well, one person’s not giving Kerry and State Department a pass and her name is Sarah Palin. Must I Repeat? Quit Making Things Up! 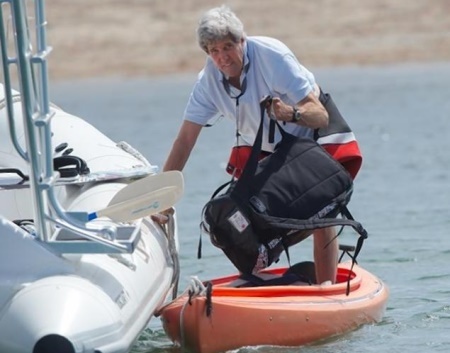 The State Department categorically denied Kerry was on his boat. Yet CBS had pictures to prove it. Goodness. There is no need to lie, even on such a “little” thing as the location of a government leader during a military confrontation happening in real time. (Benghazi? Ring a bell? There still isn’t anyone in the media who’ll find out where our Commander-in-Chief was that night.) Come on, Obama Administration! It’s no big darn deal that Kerry was on his boat! We expect, and deserve, to assume that our highest ranking public servants to whom We the People have given the most responsibility are always working — even when they’re clearing their heads and breathing in some fresh air on a yacht, or sweating away stress on a basketball court, or yukking it up with pals on the fairway… let’s trust they’re always preparing for the proverbial 3:00 AM phone call. Being on his boat isn’t the issue. Blatantly deceiving the American people is the issue. Our government, yet again, either had no idea where the boss was, or worse yet, they lied to us. (Oops-a-daisy. Correction. In Obamaspeak, we were told the “least untruthful statement.”) Our government directed its swift-ly boat changing denials to what one can only surmise is their perception of who we are: a nation of sheep — heads down, grazing away, gullible, ignorant, and undeserving of truth. Confronted with photographic evidence, the State Department merely tossed the public a handful of hay today in its tepid effort to kinda-sorta explain the whole thing away. Something about, well, yeah, so the evidence contradicted all their public claims, but… eh, no harm, no foul. And like good herder dogs, with calm authority to avoid commotion, the bureaucrats barked the suggestion that we all just move along now. No. You move along, little doggie. Enough is enough. It’s unacceptable. Remember, the nation’s Mama Grizzlies don’t just rise up to swat away threats to protect the next generation. They also school, scold, and signal to teach a lesson. One lesson taught all children is if you lie on the little things, you’ll lie on the big things. George Orwell wrote of a time when citizens could no longer trust big government, and by wearing down the citizenry through doublespeak and lies a tired country finally retreated to its dark and depressing demise. America, we shall not go there! Why? Because if we know from our nation’s forefathers that weariness is not in our blood! It’s not in our DNA to retreat. Have faith that there are enough patriots in our exceptional nation willing to fight together for what is right. Proof of this is all the families still encouraging and supporting their loved ones who choose U.S. military service. And proof of a unified commitment to defend our republic is what the independent tea party movement is all about. Disregard the constant criticism, mocking, and flagrant lies about this diverse, proud movement that still spew from big government cheerleaders and their lapdogs in the media. Despite harassment and intimidation, commonsense conservatives are rising up again to get a better view of what is ahead. They are identifying threats to our Constitution and our children’s future. The permanent political class angrily bemoans this because they know our diverse working class — those who make the world go ’round — can shake off the slumber, unify, and effectively encourage others to come out of a 2012 hibernation and demand accountability at the 2014 ballot box. It’s there we prove the average, everyday American’s ferocious strength when exercising that beautiful belief in loyalty only to a government of the people, by the people, for the people. Until then, we mustn’t have the fighting instinct of sheep. Pay attention, do your own homework on candidates and political machines, turn off media that would disrespect you by continuing to deceive, and keep the faith. It looks like our Secretary of State, Thurston Howell the Third, loves his vacation time so much he won’t call it off even for a coup. Wouldn’t it be great if Obama and his administration were as dedicated to working for the American people as they are to going on vacation?